Bandar Malaysia and Chan Sow Lin are parallel developments which will take Kuala Lumpur’s city landscape to the next level. Representations of the city’s future incarnation and how it is set to evolve into one of the world’s most functional and liveable cities, they have been identified as landmark projects under the national transformation plan which are leveraged for their high multiplier effects in spurring a vibrant economy. They are the building blocks that will prepare Kuala Lumpur for its role as the capital of a Malaysia that is fully developed economically, socially and politically by 2020. Although geographically situated in the larger Sungei Besi area, both developments have different historical and socioeconomic backgrounds. Bandar Malaysia will be located on the old Sungei Besi airport site which has historical bearing as the country’s first international airport as well as the birthplace of Royal Malaysian Air Force. In light of new developments, the location will gain greater significance with its latest role in the future as one of the most desirable environments to live, learn, work and play in the Asian region. Chan Sow Lin was once the nation’s thriving industrial hub, housing iron and tin foundries which modernisation has evolved into factories and automotive workshops. However, many of its privately owned businesses have not proven to be sustainable through economic challenges. Today, its streets are lined primarily with dilapidated warehouses, shops and squatter homes which look misplaced in a bustling city. Unlike Chan Sow Lin which has to contend with its historical and social infrastructure, Bandar Malaysia has the advantage of being developed from the ground up, allowing a masterplan to build a futuristic mixed development which is characteristic of a world-class city to be put in place. Bandar Malaysia, the brainchild of 1Malaysia Development Berhad (1MDB) will have a gross development value of RM20 billion. This strategic development will feature vibrant mixed-use community living areas complemented by commercial districts. Its key features include ecologically-friendly buildings and living solutions, large public spaces which are designed to encourage social interaction and world-class social and educational infrastructure such as event halls, academic institutions, theatres and public parks. The development is set to become one of the few region’s inclusive public transit-oriented cities designed to encourage walking and cycling using its series of well-planned pedestrian and cycling networks. Kuala Lumpur City Hall (DBKL) will build on Chan Sow Lin’s legacy as an industrial area to re-launch it as the city’s state-of-the-art automobile business park which will house companies supplying parts to as well as supporting businesses associated with the automobile industry such as accessory dealers, car showrooms and vehicle servicing workshops. Existing businesses in Chan Sow Lin have long enjoyed the advantages of the accessibility provided by its highways, well-constructed roads and LRT line. Upgrading the friendliness and connectivity of the work areas, improving the residential developments in the township and constructing new commercial districts are top priorities in DBKL’s urban regeneration agenda for Chan Sow Lin. 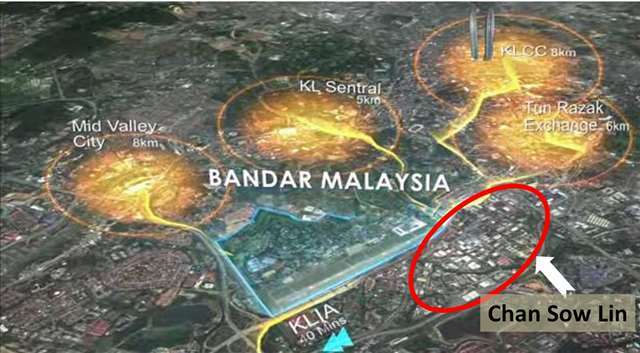 The geographical proximity of Bandar Malaysia and Chan Sow Lin will be mutually beneficial. An example of the interdependence that is foreseen between Bandar Malaysia and Chan Sow Lin is best represented by the relationship between KLCC and Ampang. In addition to a rise in property values, the Ampang area has experienced physical, social and economic expansion in order to cater to the interest in areas surrounding KLCC. Properties and businesses within the KLCC enclave rely on Ampang’s infrastructure for its residents’ social and economic growth. Bandar Malaysia as a landmark development has already positively impacted real estate values in it surrounding areas. Its development will see a rise in the population of Sungei Besi and provide a bigger market for industrial and commercial hubs such as Chan Sow Lin to service. The project will also benefit from its proximity to Chan Sow Lin as the area will provide the physical framework to house the heavier industries which are required to support the growth of Bandar Malaysia and its residents. Chan Sow Lin’s strategic location has seen a rise in the number of investors contributing to its revitalisation plan. Food for thought: With the transformation of Malaysia according to their masterplan, it is no doubt that those who choose to invest when the entire infrastructure is up will realise that it may be too late. Investment is always for those who saw the vision, took the leap of faith (having good foresight) and who have a set of sound investment criteria. If not now, then when? Awesome!